Junior School teacher Drew Blanchette ’96 loves to spend Fridays with an early morning run. So, when he started teaching at the College six years ago, he figured why not have some company? And so began Friday Morning Fitness. Now, every Friday morning, a group of boys and teachers head out for a run at 7:00 am regardless of the weather. Although the number varies – it could be three boys or it could be 20 – there is always a core group going out. Friday Morning Fitness is not an official club, therefore the participants do not receive house points for taking part. What they do get is much more valuable. Pi Boyd, Grade 9, has been taking part in Friday Morning Fitness for several years. While it’s primarily made up of Junior School students, Pi is still running with the group this year. 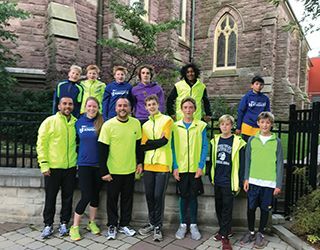 Grade 6 student Geoffrey Woollcombe also loves Friday Morning Fitness, especially running around Queen’s Park with his friends.